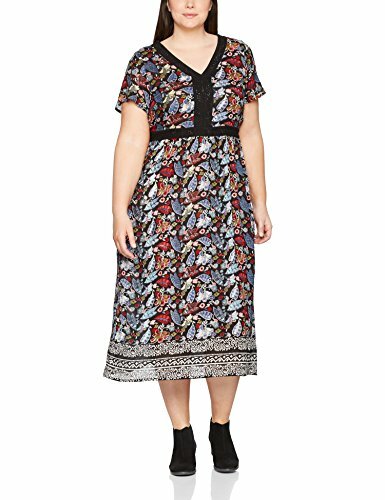 Ulla Popken Women’s Maxikleid Mit Häkeldetails Dress, Multicolour (Multicolor 90), 24. Classic maxi-length jersey dress, easy wear & easy care. Figure flattering fit with defined inset solid lace waist band & partial elastic waist at back. Features a V-neck with solid braided lace trim to the waist seam, short cap sleeves and long length. Crafted from super-soft & silky viscose; ideal for the warmer months. Falls below the mid calf; length about 50″. Swing into summer in style with this gorgeous knit dress. With a classic maxi-length of about 50″, the skirt falls to your mid-calf and is features a defined inset solid lace waist band. A V-neck with solid braided lace trim to the waist seam and cap sleeves complete the understated look. With an all over colorful print; it’s a real wardrobe keeper and can be dressed up or down to suit every occasion. Why not spoil yourself today?